The real thing is just a few days away now, so what better time to do the traditional round up of posts for the Session? The theme I asked folks to write about this month was 'Oktoberfest lagers'. Jack over at Deep Beer wondered whether Oktoberfest lagers come out too soon, and offered a theory that the russets of many an Oktoberfest lager make it worth waiting for the leaves to turn before tucking in. The Beer Nut managed to find a couple of examples of the style to write about, including an obligatory maß sized can of Eichbaum Festbier - and referred to me as 'His Royal Lageriness', which I rather like. 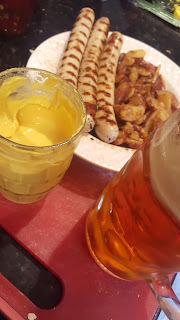 Other than being two of my favourite blogs to read, Alan at A Better Beer Blog, and the dynamic duo of Boak and Bailey both find themselves underserved locally when it comes to Oktoberfest lagers, and thus ponder the question what would festbier be in an English speaking context? I have to admit when I saw the themes for both posts I was hoping for a treatise on historical 'October beer'. Closer to home. Tom Cizauskus waxes lyrical about the delights of this year's Sierra Nevada Oktoberfest in collaboration with Brauhaus Miltenberger. Stan compares the Cannstatter Volkfest in Stuttgart to Munich's Oktoberfest, noting that they happen around the same time, and that he has never actually been to Oktoberfest, which neither have I, and I am not overly vexed by that fact, and Jon at The Brew Site reveals Deschutes' hybrid autumnal IPA, Hopzeit. Thanks again to everyone that took part, and if I failed to mention anyone's posts, just leave a message in the contents and I'll update this post. UPDATE 1: a really fascinating post from Andreas Krennmair about what was served at the real Oktoberfest in the 19th century, including a surprising visitor from Bohemia. UPDATE 2: as Thom poins out, I forgot to mention my own post, so here is a link. This month's Session is hosted by, well, me. 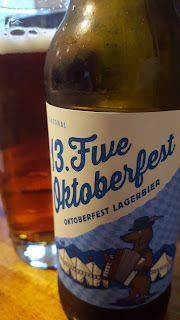 My theme for this month is Oktoberfest lager, and I have had a few well meaning people ask me why I chose the theme of Oktoberferst for the September Session. It's quite simple really, Oktoberfest begins in the middle of September, that and the fact that given the weirdness that is American brewing's obsession with having season beers in the shops well before a season actually starts, the shelves of supermarkets and bottle shops are already groaning with Oktoberfest style lagers, so why not drink a load of them? "Feel free to dress up for your tasting, dirndls, lederhosen, that Australian backpacker outfit you keep in the back of your wardrobe for special occasions. Hire yourself an oompah band, play the birdy song, and generally get into the spirit of celebrating for the 117th time the marriage of Prince Ludwig and Princess Therese. Whip out the grill and buy all the bratwurst you can find, proper bratwurst that is, from Germany. Shout "O'zapft is!" at the top of your lungs...you get the idea." How were they? Let's find out shall we? 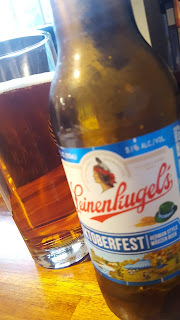 So yes, Leinenkugel's is a MillerCoors owned brewery, but I really couldn't give a rat's arse about that, this is a beer blog not a corporate structure blog. The beer is pretty light bodied, but not thin, it just lacks the heft I have come to expect from American Oktoberfests. It's a pretty inoffensive, perfectly well made beer, something that would be fine to drink on a night out, though the lingering sweetness in the finish would get tired after a while, I like my beer bitter and my lagers clean. The local beer in my selection, Blue Mountain being about 20 miles from my house here in Central Virginia. 13.5, the number of degrees Plato that is the starting gravity for this beer, is very much the archetypal American made Oktoberfest lager. 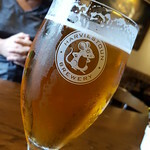 It has a nice smooth finish that isn't so sweet as to be cloying, but I find it has a slightly odd bite right at the end and lacks the clean snap I would expect from a Central European lager. Still, a decent beer for an afternoon in their brewpub, preferably in the rain, but I am weird that way. 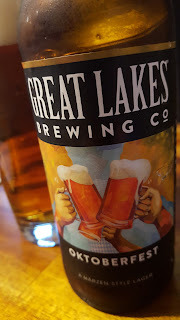 I quite like Great Lakes beers, in particular their porter, but this beer just didn't do it for me. It has a distinct lack of bitterness to balance out the sweetness of the malt, and the finish was oily sweet, not the clean snappy bite I expect from a lager beer. Not so much bad as misguided. I don't recall having an Otter Creek beer before, but this collaboration was one I really enjoyed. It has the expected lager snap that I love, and it very nicely balanced so that drinking it is an absolute pleasure. 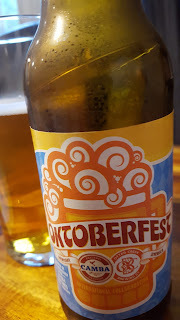 I may have mentioned this before, but I find myself liking the more modern paler interpretations of Oktoberfest lager than the darker sweeter efforts that seem to be the norm over here. More breweries should work with German/Central European breweries for their collaborations. I really am biased toward this beer, I am sorry, but these annual collaborations are becoming the highlight of my drinking year. This year has a fantastic firm bitterness that scrapes the palette and makes you want another mouthful. The beer is hefty enough to be interesting without being overwhelming, and it has that perfect clean finish that I want, it is delish. End of story. 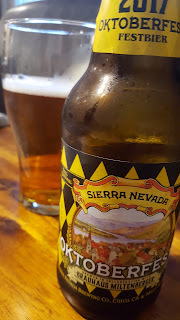 Keep on doing this Sierra Nevada! So there we go, five Oktoberfest lagers, all of which worked fine with my bockwurst, kartoffeln, und senf...and I am pretty sure it won't be the last time this autumn that I pull a package of German sausages from the freezer, fill up my 1 litre glass with lager, let's be honest it'll be Sierra Nevada's until the shops run out, and pay homage to my Germany ancestors and my own Germanophilia. Prost!